This little piggy was saved from almost certain death when a family noticed him on the side of a road during a blizzard and rescued him just before a snow plow came through. 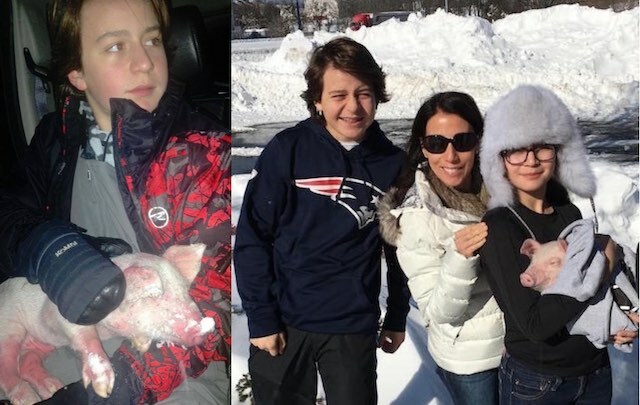 The Smith family was returning to their hotel during a ski trip in Pennsylvania during this weekend’s winter storm that dumped more than two feet of snow on the Eastern U.S. The family named him “Wee Wee” and spent the evening nursing him back to health — wrapping him in blankets and feeding him a meal of smashed bananas. “I told the kids, ‘Listen, we don’t have any choice but to take this pig in. We’re gonna see if we can’t warm him up…when we get to the hotel,'” Perry Smith told ABC News. They took Wee Wee “all the way home” with them to Chevy Chase, Maryland following their ski holiday, but they won’t be able to keep the cute piglet, which will weigh 300 pounds or more when fully grown. The family’s found him a permanent home at Poplar Spring Animal Sanctuary, but in the meantime he’s making himself at home with the Smiths.